Looking for a way to simplify your mornings? 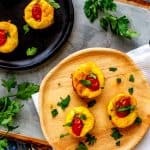 These Keto Egg Muffins are just what you need! They can be made ahead, freeze beautifully, and are easy to grab and go when you are in a hurry. They are basically impossible not to like and great to have on hand for breakfast all week. 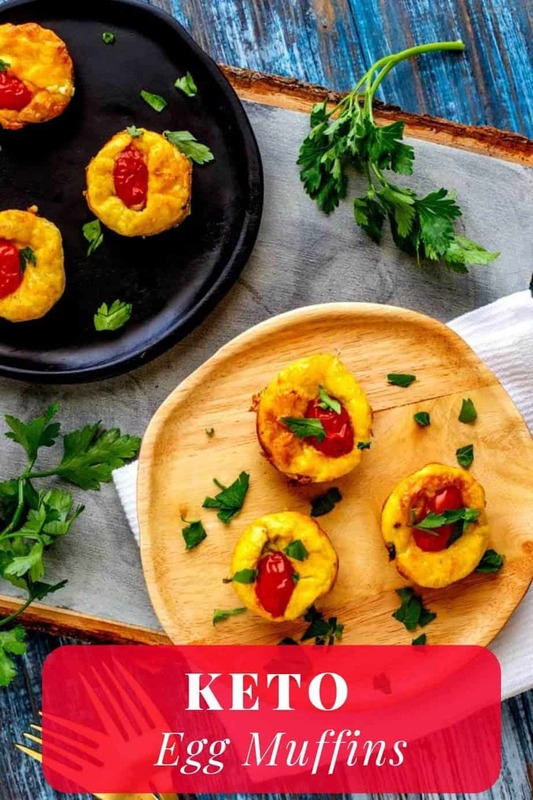 These Keto Egg Muffins are perfect for meal prep! Even when sugar was still a part of my diet, I’ve never been one to crave a sweet breakfast. Yes, walking by a bakery can be tempting, but I learned early in life that if I started my day with too many carbs in the absence of protein, I would crash in a couple of hours. Don’t even get me started at how cranky starting the day with sugar makes me. So, I’ve always been on team savory breakfast. These days, I often opt to put butter, MCT oil, and collagen protein in my coffee, and that will hold me over until I can grab an early lunch. But when I work out first thing, I need something more. 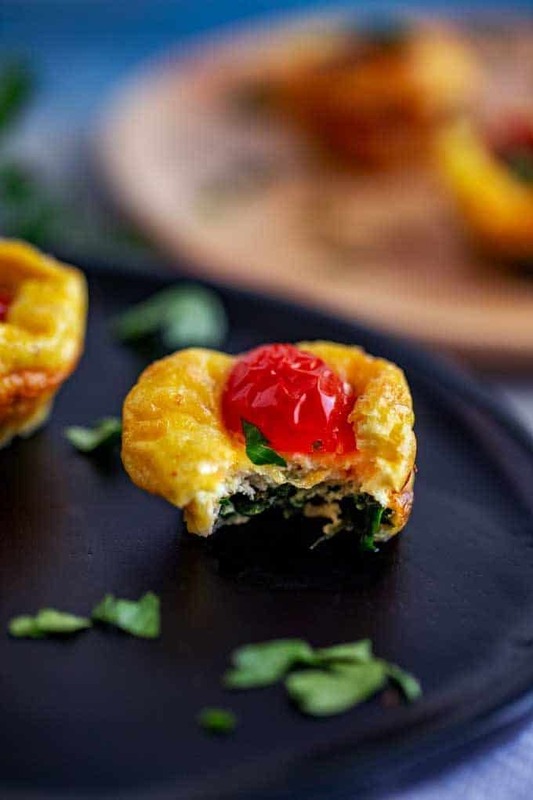 Enter these Keto Egg Muffins. I think you are going to be just as wild about them as I am. They are literally the easiest way I’ve found to get veggies into my morning meal. They are perfect when you are racing around with the kids in the morning and need a quick bite! These take less than 30 minutes! Preheat your oven to 425 degrees. 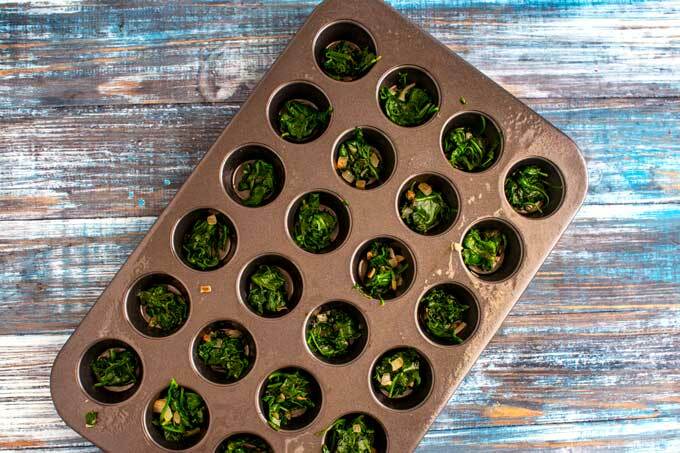 Coat a nonstick 12-cup muffin pan or a 24-cup mini muffin pan with cooking spray. 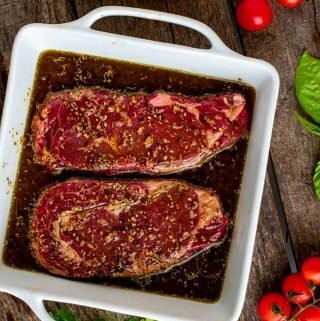 Spay a skillet with oil and heat to medium. Add onion and cook for 3 minutes. Add spinach and cook until wilted, about 2 to 3 more minutes. Chop the spinach and transfer to a bowl. 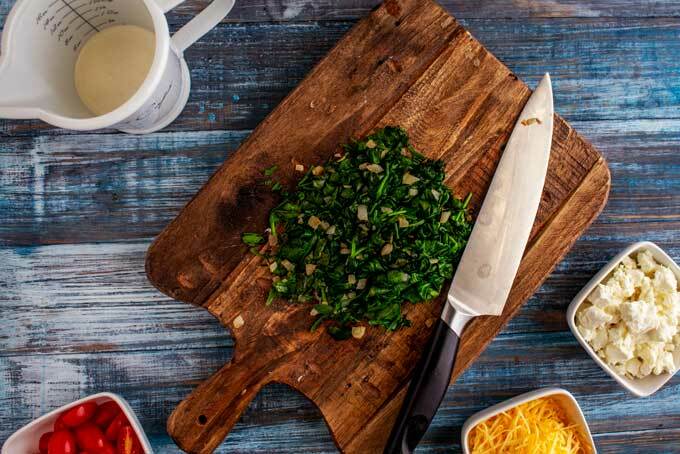 Divide the chopped spinach among the prepared muffin cups. Top the spinach with the cheeses. Whisk together eggs, cream, salt, pepper and cayenne in a large bowl. Top with tomatoes and bake until set – about 15 to 18 minutes for large muffins and 10 to 12 for small ones. Add in 1 teaspoon lemon zest to the eggs. Use baby arugula or kale in place of the spinach. 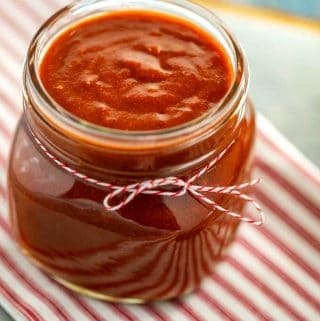 Omit the cayenne pepper and instead use 1 teaspoon – 1 tablespoon of hot sauce. (The amount you use will depend on how spicy you like things and the type of hot sauce you use. 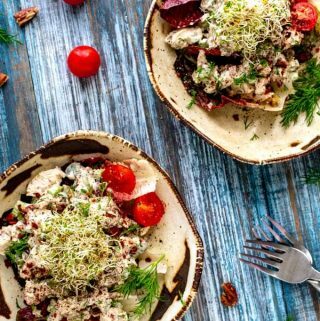 Use blue cheese in place of goat cheese. 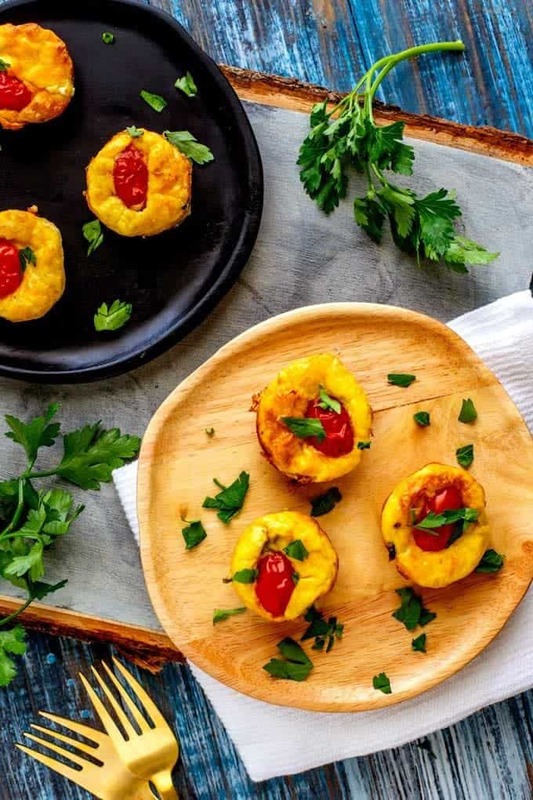 These Keto Egg Muffins keep perfectly for breakfast all week! How long will egg muffins last in the refrigerator? You can refrigerate egg muffins in an airtight container for up to a week. Will eggs stick to cupcake liners? No. 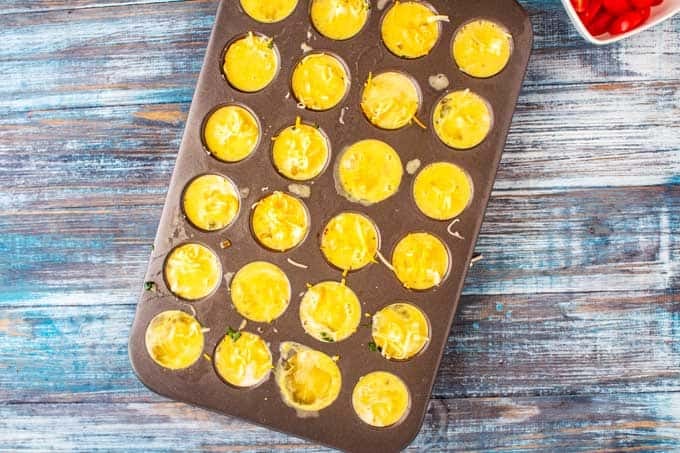 In fact, you can cook the eggs directly in the muffin tin without using a liner and they will still release easily. Can you reheat egg muffins in the microwave. Yes, if you use the microwave, you can reheat them in about 30 seconds. The actual time will vary according the the power of the microwave. These cheesy egg muffins are perfect for your busy work week. You can enjoy them hot from the oven, or eat them cold when you are rushing out the door. They freeze well, making them perfect for meal prep. Preheat oven to 425 degrees. 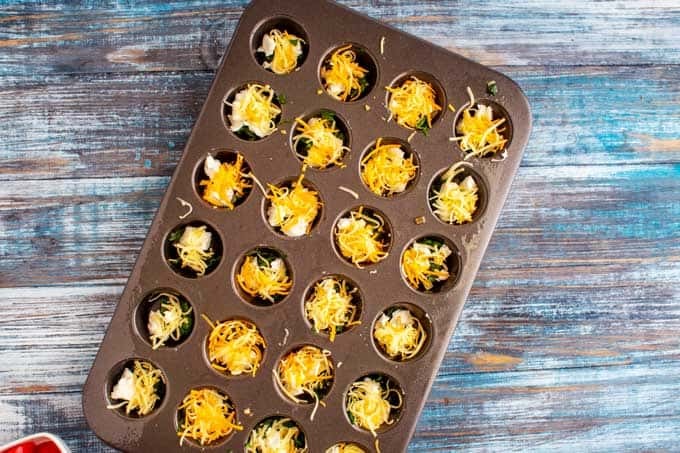 Coat a nonstick 12-cup muffin pan or 24-cup mini muffin pan with cooking spray; set aside. 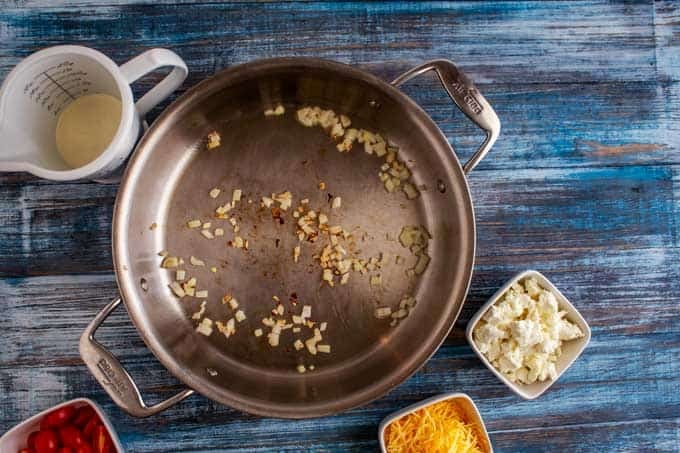 Spray a skillet with oil and heat to medium heat. Add onion, and cook for 3 minutes. Add spinach, and cook until wilted, about 2 to 3 minutes. Roughly chop spinach transfer to a bowl. Divide the spinach and onion between the prepared muffin cups. Top with goat cheese and cheddar cheese. 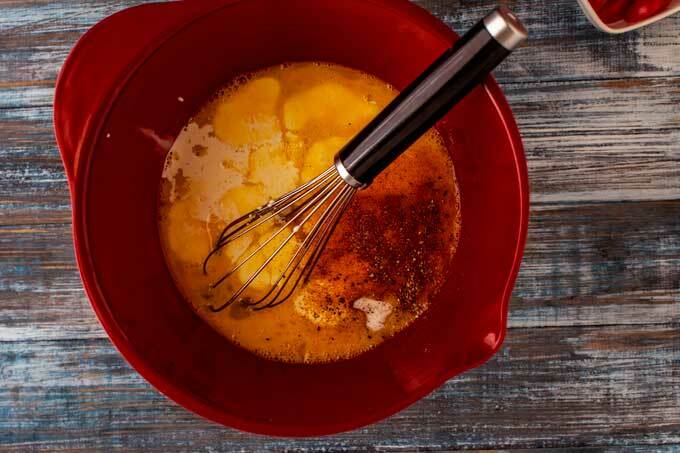 In a large bowl, whisk together eggs, cream, salt, pepper, and cayenne pepper. Divide the egg mixture among the muffin cups. Bake until set, about 15 to 18 minutes for large muffins and 10 to 12 minutes for mini-muffins. Allow to cool slightly in the pan, and then remove. 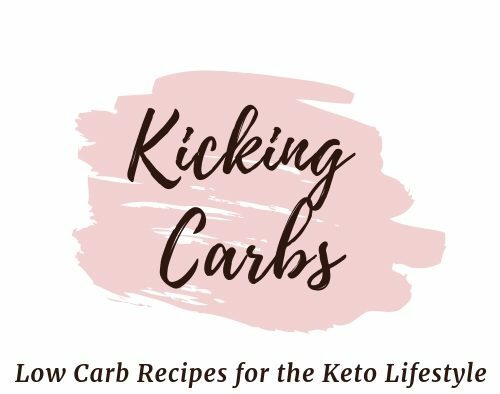 Welcome to the Kicking Carbs website (“site“). Wendy Polisi is not a health professional and information on this blog, arising from this blog, or social media related to this blog is only her personal experience and opinions. You should always check with your health care provider before beginning any diet, health plan, or lifestyle change.